Let’s be honest, when you’re married with kids keeping the romance alive can get pushed down the list (hands up, who looks at their bed and yearns for more zzzzzs?). Our bed is usually a pile of blankets, pillows, books, and kid’s toys. A cozy, comfy nest it may be, but a sanctuary it is not. And I’ll confess: I love how a made- up bed looks, but rarely make ours. It’s just one of those things that has inevitably become less of a priority. But we can all dream of a perfectly tidy and styled bedroom can’t we? Calming, cozy, and serene are three words I like to think about when it comes to this particular room of the house. And I think this room might have that covered. 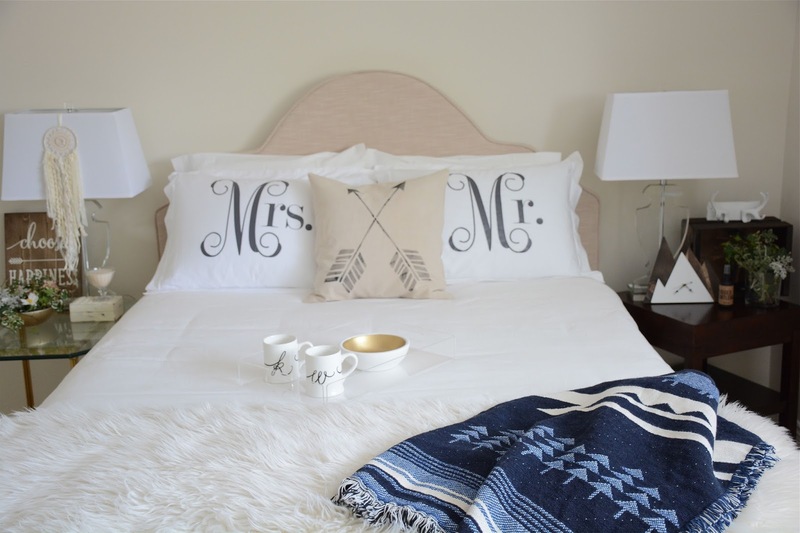 Thanks to Old Barn Rescue, I had the chance to style a bedroom around their ‘Mr & Mrs’ pillow shams which totally had me thinking back to my wedding registry and all of the fun I had picking out things for our home. I love having accents in a room that compliment the overall style while showing the individual personalities of the occupants. For example, using the same lamps but different night stands for a more masculine/ feminine touch. I hope you like these photos as much as I liked having an excuse to decorate this room! See below for all the details. The story behind the company goes like this: In 2003 a barn on one of the co- founders’ family farm had to be torn down, (the inspiration for the name), and rather than letting the 120- year- old wood go to the landfill, the co- founders gathered it up and started creating unique pieces using reclaimed materials. They now source materials from a variety of sources to create upcycled vintage- inspired signs and decor. The company also offers vinyl wall decals and recently added clothing and fabric decor items to their stock. In Spring of this year the brand added their Threads line and now offers everything from onesies, t- shirts, pillow shams, and more featuring their heat- pressed vinyl designs. All of the products are lovingly handmade using vintage and new materials. Make it cozy– Blankets and pillows are an inexpensive way to add colour and texture, plus are super cozy to snuggle into. This is the room you sleep in after all, and you want it to be somewhere you love to curl up. Easy update- If you don’t want to invest in an entire new set of bedding, sheets, etc, buy some new pillow shams as a simple way to freshen the look of your bed. They are an easy item to replace and there are lots of options out there to suit your style. 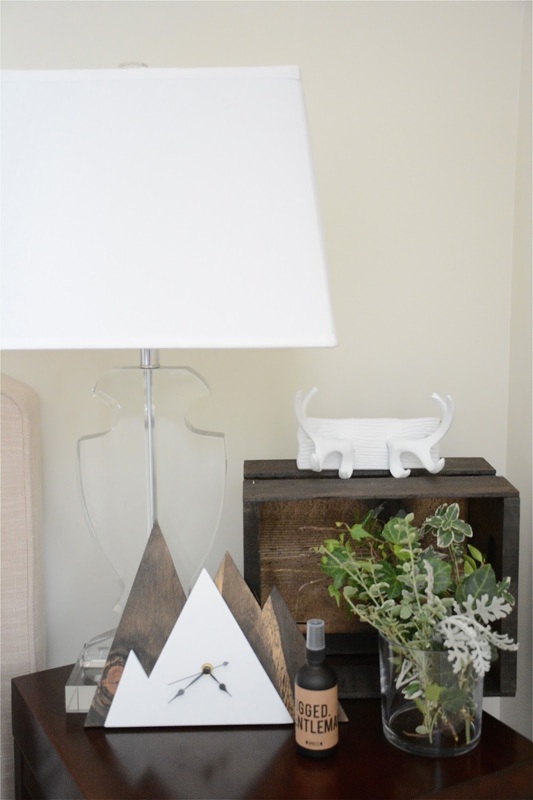 The same goes for your nightstands: swap them out and pair with some new lamps for a quick and simple update. Colour vs texture- A classic styling tip: If you love lots of colour, keep the shapes and textures in the room simple, so it doesn’t become visually overwhelming. The opposite is true if you like a simple/ monochromatic palette: add in textures and shapes to create visual interest (think faux- fur, fabric textures, and accent materials such as glass and wood for starters). Show your personality- It’s your bedroom, so enjoy having some fun! Add in details that show you and your hubby’s tastes. To avoid it becoming too busy/ cluttered, pick accents that compliment each other, even if they are on opposite sides of the bed (see tip #3 above). Storage containers such as crates and boxes can also help store items to avoid mess and clutter. Visit the Old Barn Rescue website to learn more and to view their complete product line. A big thank you to Old Barn Rescue for these pillow shams and inspiring this post, and to The Handpicked Home shop for providing items to style this room.